ADNET Systems Inc. has been awarded the Space and Earth Science Data Analysis (SESDA-IV) contract by the National Aeronautics and Space Administration (NASA) to support the Goddard Space Flight Center (GSFC) in Greenbelt, Maryland. SESDA-IV is a five-year cost-plus fixed-fee contract with a total potential value of approximately $250 million. Under SESDA-IV, ADNET will provide a broad range of services to support Earth and Space science research and development, data operations, as well as activities in information system technologies, engineering, and science communication, education and public outreach that enable the Sciences and Exploration Directorate to successfully carry out its science missions at the Goddard Space Flight Center (GSFC). SESDA is the premier Space and Earth science contract at GSFC and this award represents the third straight time ADNET Systems has been selected for this prestigious contract. Over 300 scientists, engineers, and education outreach specialists support the SESDA contract through a broad range of science disciplines, including solar and space plasma physics, astrophysics and astronomy, planetary studies, atmospheric science and climatology, oceanography, land processes, geodynamics, and solid earth geographics. “All of us at ADNET are pleased and excited to continue our partnership with NASA and we are thrilled to be selected as the SESDA contractor for the third time.” said Ashok Jha, President and CEO of ADNET. 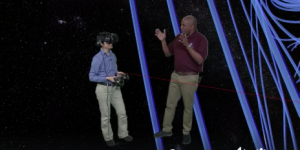 SESDA education and outreach staff supporting the MMS mission and NASA’s Space Science Education Consortium (NSSEC) joined forces with NASA EDGE at Langley Research Center in Hampton, Virginia to produce a demonstration dubbed the “Mixed Reality” live show. By utilizing virtual reality (VR) and a new compositing technique called Mixed Reality, this innovative live show allowed the audience to participate and interact in real-time with each other and a virtual MMS spacecraft. The demonstration was streamed live via Facebook podcast at the NASA EDGE video page. Bill Fink presenting work of the SESDA HECN task at the SuperComputing 2018 (SC18) event in Dallas, TX in November 2018. 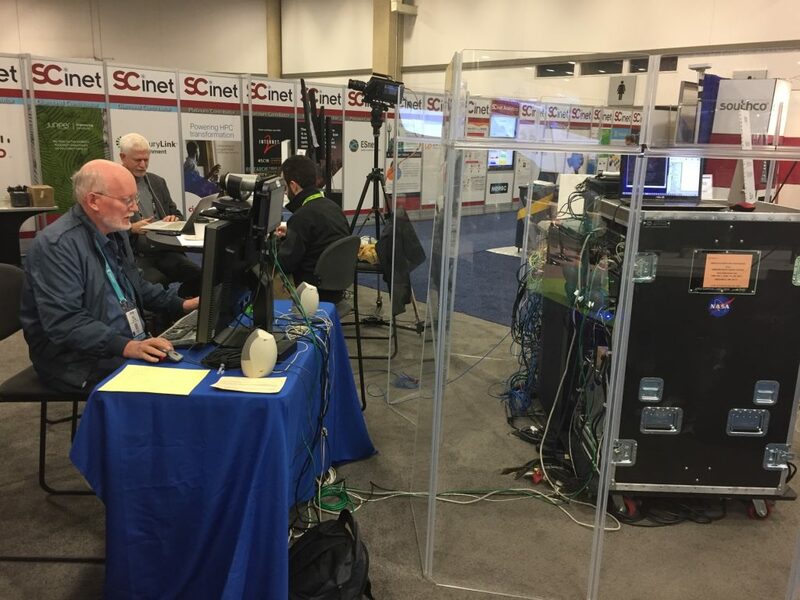 SESDA’s HECN team collaborated with various partners (Mid-Atlantic Crossroads (MAX), Naval Research Laboratory (NRL), StarLight optical network exchange facility, CenturyLink, SCinet) to create a multi-100-GigE network topology for live demos at SuperComputing 2018 (SC18) in Dallas, TX. This included 4×100-GigE network paths between NASA Goddard and SC18, 2×100-GigE network paths between StarLight and SC18, and 2×100-GigE network paths between NASA Goddard and StarLight. At SC18 they demonstrated the use of NVMe over Fabric (NVMe-oF) technology using internet Wide Area RDMA Protocol (iWARP) across a 4×100-GigE network infrastructure as a SCinet Network Research Experiment (NRE). This showcased very high performance disk-to-disk network data transfers between a single pair of high performance NVMe servers, one at NASA Goddard and one at SC18, with a very low level of system CPU utilization and achieved an aggregate throughput of about 130 Gigabits per second (Gbps). They also performed more traditional network data transfers using the normal Linux TCP/IP network stack, which achieved an aggregate throughput of almost 200 Gbps while totally consuming all of the system CPU resources.